Biodegradable polymers have experienced a growing interest in recent years for applications in packaging, agriculture, automotive, medicine, and other areas. One of the drivers for this development is the great quantity of synthetic plastic discarded improperly in the environment. Therefore, R&D in industry and in academic research centers, search for materials that are reprocessable and biodegradable. 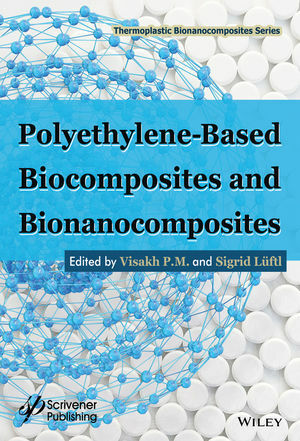 This unique book comprises 12 chapters written by subject specialists and is a state-of-the-art look at all types of polyethylene-based biocomposites and bionanocomposites. It includes deep discussion on the preparation, characterisation and applications of composites and nanocomposites of polyethylene-based biomaterials such as cellulose, chitin, starch, soy protein, PLA, casein, hemicellulose, PHA and bacterial cellulose. Sigrid LÜFTL, PhD, worked for more than 13 years at the Vienna University of Technology as a research associate. She was in charge of failure analyses and degradation studies of polymers. Further, she gave courses in specialty polymers and biocompatible materials. In 2016 she founded her own company IWILL. Currently, based on the experience gathered during her work at the university she teaches students for instance how to deal with learning difficulties or how to write a scientific thesis. Moreover, she is the author and co-author of several scientific publications and editor of two books. Sigrid Luftl and Visakh. P. M.